It was love at first sight. 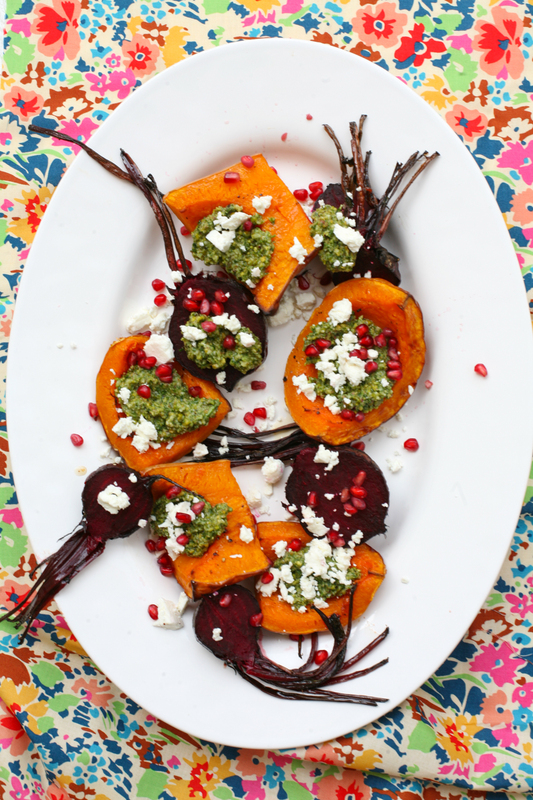 The vibrant butternut squash (the beetroot is my own addition) with dollops of pistachio pesto infused with fresh dill, coriander and parsley, crumbled feta and bejewelled pomegranate seeds. Simple and yet so very right. I did not even need to try it to know that I would love it and include it in my culinary repertoire from that day forth. It was served to me by the very likeable Sabrina Ghayour earlier this year at her hugely popular supper club that takes place in her west London residence. Twelve or so hungry diners feasted on a number of mouth watering Persian dishes that were lovingly prepared by Sabrina herself. Her recipes and ingredients sing to me and I can honestly say that I actually want to cook and eat a large number of them. Dried lime, lamb and split pea stew or saffron chicken, fennel and barberry stew or bamia – bring it on. The recipes will really come into their own in the autumn and winter time as there is even a section dedicated to ‘soups, stews and tanginess’, perfect to serve up and nourish the soul on cold, blistery autumnal days. That said, there are also sections on ‘salads and vegetables’, ‘roasts and grills’, ‘mezze and sharing plates’, ‘breads and grains’ and finally ‘desserts and sweet treats’ so something for everyone no matter what hemisphere you are living in. The recipes are easy to follow and beautifully photographed. I also particularly love the cover which is not only eye catching with it’s title that rolls off the tongue, but it also has a very tactile cover. As you pass your hand over it gives the impression that spices and rose petals have really been imbedded into it’s very cover. Such a clever and original idea. This recipe you can eat as is, or accompany it with another in her book. 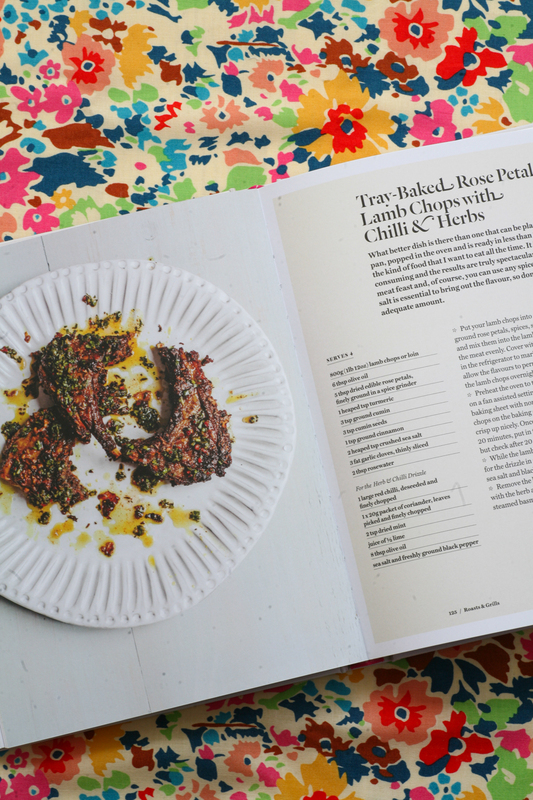 I thought the ‘tray-baked rose lamb chops with chilli and herbs’ (above) would be a particularly delicious combination. If you want to learn more about Persian food and feel comfortable cooking it for yourself then I cannot recommend the book more highly. 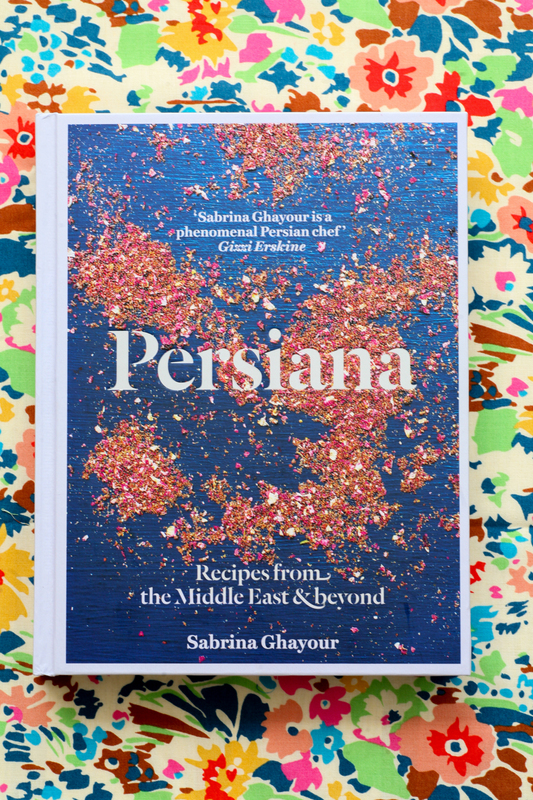 Sabrina’s chatty, informative and unpretentious style will connect with it’s readers and guide them through the very exciting world of food from Persia. 1. Preheat your oven to 180 degrees if using fan oven or 200 degrees if not/gas mark 6. Place the chopped butternut squash and intact beetroot on a baking tray lined with non-stick baking paper and cover the vegetables in olive oil, pepper and salt. Place in the oven for 50 minutes so the edges of the butternut squash begin to char. 2. Meanwhile to prepare the pesto, place the pistachio, parmesan chunks and a glug of olive oil into a food processor and mix together. If it remains quite thick in texture add some more olive oil to soften it. 3. Add all the herbs, chilli oil and lemon juice and blitz together with a sprinkling of sea salt. Taste to make sure the flavour is well balanced. Leave in the refrigerator until ready to use. 4. To serve, place the roasted butternut squash and beetroot (now cut in two) on a serving platter. 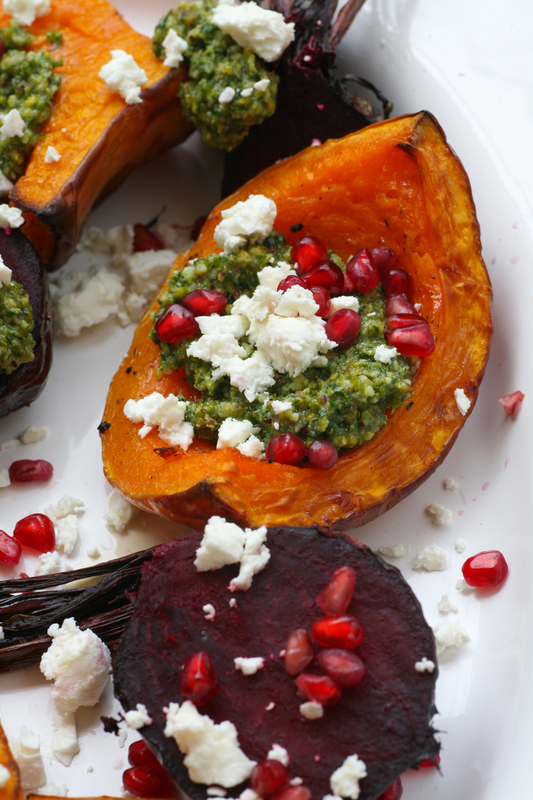 Place dollops of the pesto on each vegetable portion, crumble the feta on each portion and around the platter. Finish by scattering the pomegranate on top. Voila you have the most pleasing of meals to dive into. This entry was posted in Away Days, Vegetable, Vegetarian and tagged beetroot, butternut squash, feta, Iranian food, lunch, Persian food, Persiana, pesto, pistachio, pomegranate seeds, Sabrina Ghayour, supper club. Bookmark the permalink. Your presentation is outstanding! Thanks for mentioning the book. It’s cover is gorgeous and so smart!!! That is so kind of you to say Mimi thank you. Yes I adore the book. Beautifully put together. Love your photos! This dish looks so delicious with the sweet and savoury flavorings. I can’t wait to give this a try. Thank you. Yes I too love the colour and vibrancy. I hope you get to try it soon. Thanks for commenting.